As an association professional who has been involved in running a certification program for almost a decade, credentialing has always been important to me. Certification programs should be based on a particular industry and set the standard related to knowledge or skill of an individual. Accreditation is an institutional certification program and outlines what a business or company needs to do to meet the standard. Credentialing is a means to allow an industry to set minimum standards for an entire profession. To me, a credentialing program says – we care about the product or service we produce. For an individual professional, voluntary certification is a process by which we can learn/grow and show our profession that we are proficient enough in our craft to meet the standard. I have been surrounded by certification or accreditation programs for some time now and value organizations that work to establish and maintain standards within society. I am the Chief Staff Executive for three credentialing programs. My company is an Accredited Association Management Company through the AMCI Institute. My husband is a Certified Public Accountant. 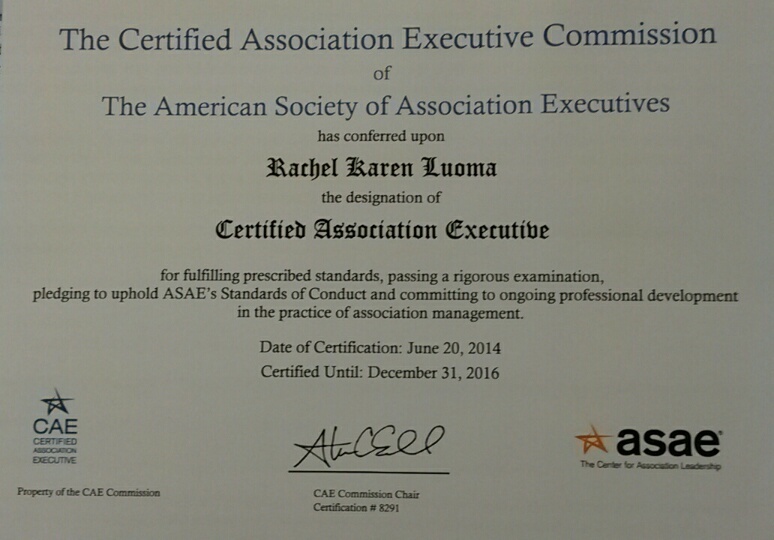 Most recently, I received my Certified Association Executive credential. While every certification or accreditation program is different, programs have standards that they should be meeting in order to remain a valid industry credential. Credentialing organizations such as the American National Standards Institute and the National Commission for Certifying Agencies are accrediting bodies for certification programs. They work to establish and maintain standards for credentialing programs related to criteria, assessment, maintenance, governance, etc. One of the most important aspects of a certification program is the Job Task Analysis (JTA). 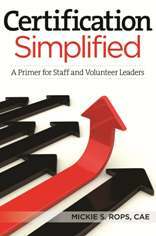 The Job Task Analysis (JTA) is the foundation of a certification program and is the “formal process for determining what the population being certified needs to know and be able to do.” For those newly involved with certification, I highly recommend the book, Certification Simplified, published by the American Society of Association Executives. For those of you interested in becoming a Certified Association Executive, keep in mind that the CAE Commission is launching their new JTA in 2015. This means that there may be some changes to the content outline or the authoritative literature. It is important to remember that these changes are to ensure that new candidates are tested on relevant industry standards and that the CAE credential remains valid. Due process: A candidate for certification must be given due process related to testing and appealing a decision made by the credentialing organization. Criteria: The eligibility requirements, standards, etc. should be no more stringent than necessary to demonstrate competency or quality. Intellectual Property: Protection of examination content can lead to legal issues related to copyright protection. Antitrust: The process for certification cannot be used to limit competition among professionals. Conflicts of Interest: Decision making for the governing body should be autonomous and there should not be influence from related entities. Defamation: Credentialing programs should avoid statements that anyone who is not certified is less competent than those who hold the certification. For my fellow association professionals, I encourage you to research the complexities of credentialing programs, especially if your association or industry has them. There are great resources that exist regarding the program, psychometric and legal standards of credentialing programs. I am proud to say that all the credentialing programs that I am involved with are consistently looking at their program to ensure that it is a valid and reliable process. I also encourage my fellow association professionals to obtain professional credentials. Some of them include, but are not limited to the Certified Association Executive and the Certified Meeting Professional. I know there are many more certification programs out there and I would encourage you to leave information on them in the comments section of this blog so that other readers can learn more about them. I can say from my experience that I learned a tremendous amount preparing for my CAE examination. I am a stronger association professional for having gone through the process. For non-association professionals, what credentialing programs exist within your profession? Seek out those professional designations and commit to taking the steps needed to obtain those credentials. But remember, a credentialing program is only as strong as its standards – so make sure you associate yourself with the right program. Rops, M.S. (2011). Certification Simplified. Washington DC: American Society of Association Executives. ‹ PreviousWE ARE PLANNING AN EVENT! WHAT DO WE DO NOW??? I would like to quote the below excerpt in the book described below. Thank you for your interest in utilizing an excerpt from my blog, A Tale of Two Certifications: Not All Credentialing Programs are Created Equally. You can certainly include that excerpt outlined in your post above in your upcoming book. I wish you the best of luck in your endeavors. Please let me know if I can be of any additional assistance.